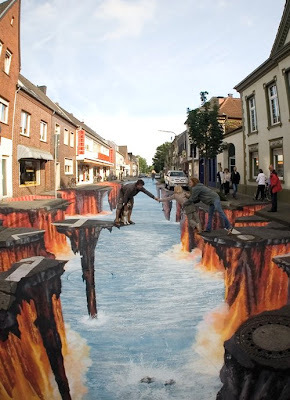 This absolutely AMAZING chalk drawing was created by Edgar Mueller. Click it to see the enlarged version. Posted by Optiguy at 7:27:00 p.m.
that would be kinda scary if you lived on that street. I would pee my pants just walking out of the house. February 22, 2009 at 1:32 p.m. I'm vicky and I live in Spain. February 22, 2009 at 2:14 p.m. Sorry, I don't have MSN. February 23, 2009 at 7:32 p.m.
February 26, 2009 at 5:03 p.m.
February 26, 2009 at 5:04 p.m.
February 26, 2009 at 5:05 p.m.
March 10, 2009 at 4:45 p.m.
May 26, 2017 at 3:25 a.m.